ARS research into how and when plants use the phosphorus in manure may aid farmers as they try to stem nutrient runoff into waterways. "A future challenge," says soil scientist Thomas J. Sauer, "will be not only to avoid over-application of phosphorus to soil, but also to ensure that in doing so a farmer does not make the land phosphorus deficient." Sauer and soil scientist John L. Kovar focus on phosphorus as they study nutrient management of animal manure at ARS' National Soil Tilth Laboratory in Ames, Iowa. "Farmers are encouraged to reduce nutrient runoff from their fields because of its effects on waterways," says Kovar. "Aquatic plants absorb nutrients like phosphorus, grow more, and consume oxygen in the water when they die and decompose. Also, the decomposition process often gives drinking water a bad taste." Kovar says that when soil is saturated with phosphorus, costs and labor involved in applying more are wasted, as it goes unused and becomes vulnerable to loss in runoff or movement into groundwater. The scientists compared 27 manure-soil mixtures, which included 15 soils from 7 states and manure from turkey, beef, swine, and dairy farms. Each manure-soil combination was divided into containers and incubated for 1 year. During the year, phosphorus was extracted from the soil eight times by three methods commonly used by farmers and regulators. Sauer says all three tests were used with each manure-soil combination. "The study was unique in how we simulated field conditions," says Sauer. "We mixed the manure and soil together, then we varied the incubation temperature so that it was cool in the morning and warmer in the afternoon. We also changed the temperature and moisture periodically to simulate seasonal changes." "We set out to find when plant availability of the phosphorus peaked," says Sauer. "Farmers who know when and what amount of phosphorus is available to plant roots have an advantage in making sure they don't over- or undercompensate when they replace the phosphorus removed at harvest." The results of the experiment can be used to predict plant availability of phosphorus for various soils and crops. The scientists found that, on average, 43 percent of the phosphorus applied in manure was plant-available during the year after application. Sauer says this is important to farmers trying to replenish phosphorus removed at harvest with the same amount of the nutrient in added manure. "If a soil has low to moderate levels of available phosphorus, the grower may need to apply more than the amount of phosphorus removed at harvest to meet crop needs," he says.—By Luis Pons, Agricultural Research Service Information Staff. This research is part of Water and Quality Management, an ARS National Program (#201) described on the World Wide Web at http://www.nps.ars.usda.gov. Thomas J. Sauer and John L. Kovar are with the USDA-ARS National Soil Tilth Laboratory, 2150 Pammel Drive, Ames, IA 50011-4420; phone (515) 294-3416 [Sauer], (515) 294-3419 [Kovar], fax (515) 294-8125. 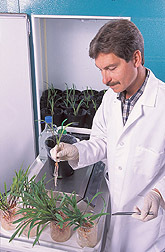 "Knowing When Plants Capture Phosphorus" was published in the January 2003 issue of Agricultural Research magazine.